One of the most frequent complains from British soldiers in the Crimean war was that the British knapsack was too heavy. The French were believed to carry a lighter load and indeed, cartoons appeared in Punch Magazine to that effect and letters were written at length to the times. The issue of the British knapsack had first been raised in 1848 in South Africa when the current model was found to be too heavy and cumbersome; at the Chobham Camp of 1852 various models were trialled, including those from Austria and Prussia and it was concluded the Prussian knapsack was the best model and should be emulated because, unlike the British model, it did not have a solid back and could thus mould to the wearer's body. However, nothing was done and the British soldier marched off to the Crimean War wearing his 1822 or 1846 knapsack made by Messrrs J. Trotter of London. Now, about the weight of the pack. Lord Raglan in an Order of the Day in February 1854 stated that the pack should contain the following articles and also listed their weight. In Heavy Marching Order were added the mess-tins, and water canteen and the bill hook,camp kettles etc which were caried in rotation. Then additionally was the three-days ration. It was estimated the load carried by the Guards was heavier than the Line, the total weight carried by the Guards being 80lbs and the Line 56lbs. The French 1854 pattern knapsack - shown open (top) and closed (below). 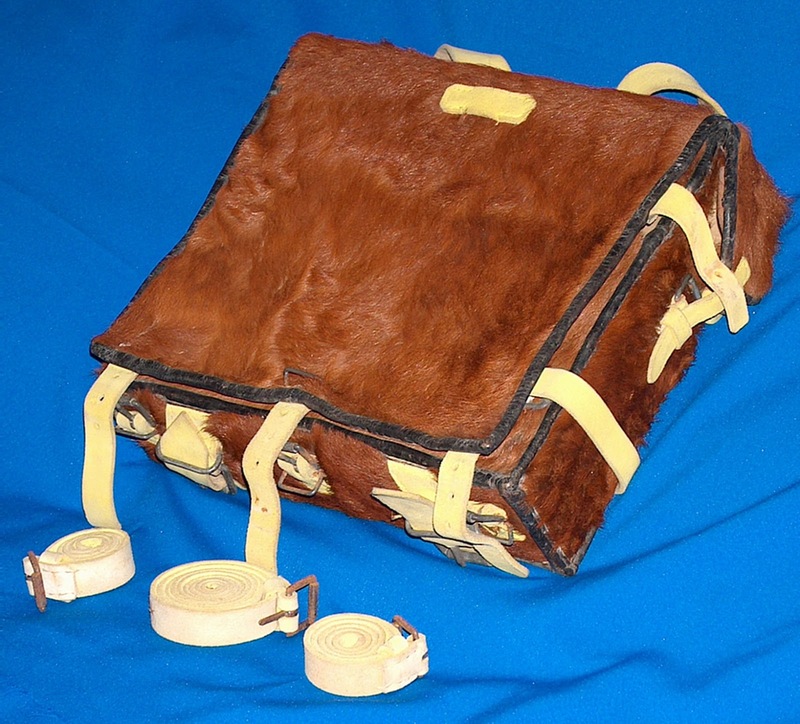 The French knapsack was of the 1854 model. It was made from cow hide with the fur left on. 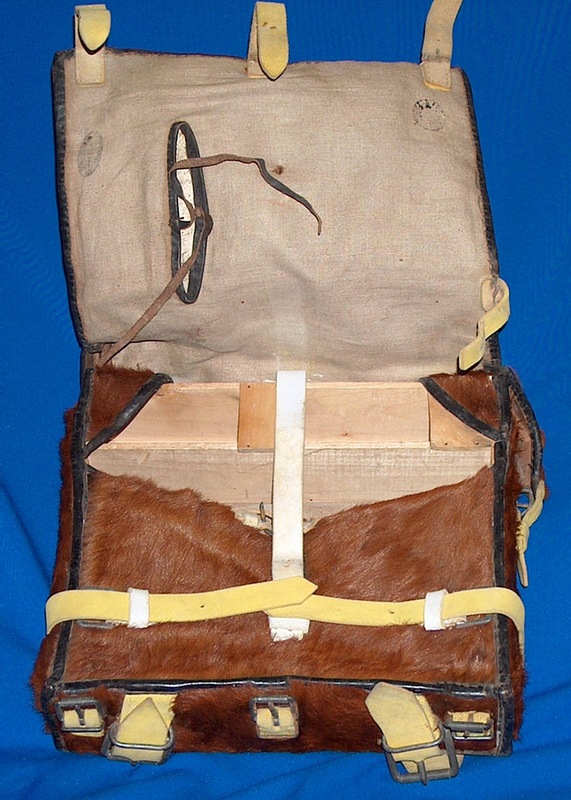 Inside was an open wooden frame (sides only) to give the pack some rigidity; in the top of the frame was a compartment where the additional ammunition was stored, accessed via a flap on either side of the pack. This did away with the need for a tin ammunition magazine. The total weight carried, therefore was a staggering 75lbs. Excluding the weight of the uniform. Thus, the load carried by the French Line infantryman was lighter than that carried by hte British Brigade of Guards by 5lbs it was considerably heavier than the load carried by the British Line. However, the load carried by the French included his own tent, something which the British would sorely miss in the opening stages of the campaign on the Crimean Peninsula as they had no tents until October 1854 when they were finally unloaded from the British Transports. General J B B Estcourt, the Adjutant General to Lord Raglan in a letter to his superioer, General George Augustus Wetherall, the Adjutant General at Horse Guards suggested that the reason why the French pack appeared to be lighter was due to it having a more ergonomic design. He said that the French pack was worn high up on the back, the top of the pack being level with the shoulders, the greatocat roll end tent therefore being head height, whilst hte British pack was worn lower down with the greatcoat roll at shoulder hieght. 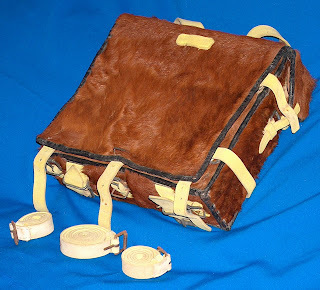 He also admitted that because the Britishpack hasd a solid back it would not conform to the shape of a soldier's back and thus "hung off" the back, not belped by the way the pack was loaded making it top-heavy. The breast-strap, concluded estcourt was to literally pull the pack hard against the soldier's body in a very unnatural way. He thought the weight of the French pack, from it being worn so high up, was taken directly on the shoulders and down the spine, whereas the British pack the weigh was taken on the lower back, but more importantly, mostly accross the chest because of the breast-strap. Biomechanically, Estcourt was correct in his assumption. The French pack had its 'centre of mass' high-up on the body, distributed through both shoulder straps. The high-up 'centre of mass' would have forced the soldier to lean forward slightly to counterbalance the weight/ find a point of equilibrium. The weight of the pack would have been transferred to the shoulders and down the spine via the shoulder straps. Some of the weight would also have been taken by the waist belt which connected to the shoulder straps of the pack. The British pack being worn lower down and being forced away from the spine would have leaned backwards, away from the shoulders, hence the need for the breast-strap to keep it close to the spine. The 'centre of mass' being lower down meant that the soldier would have been leaning back slightly as the maximum weight of the pack was below the optimum point of equilibirum. Furthermore, the weight of the pack would not be taken on the shoulders but the lower back and on the breast-strap. The breast-strap would have constricted breathing, compounded by the soldier having to lean back slightly to find the equilibirum of the 'centre of mass'. In additon, the French ammunition pouch and side-arms were worn on a waist belt which buttoned onto the uniform jacket. This meant that their load was distributed through the shouldes (where the uniform hung) and on the waist; furthermore the weight of the waist belt was alleviated through it attaching to the pack shoulder straps. British ammunition was carried on a shoulder belt which was not as ergonomic and did not have its weight distributed. To conclude, the issue of the weight of the knapsacks was not due to the weight carried but the way the pack was worn: the French pack was heavier but worn in a more ergonomic way which made it easier to carry such a heavy load.